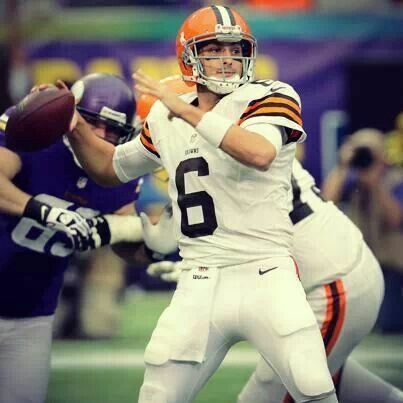 Steady play by Brian Hoyer has been key to a Cleveland surge. The funniest and more commonly referred to moniker of the city of Cleveland is “The Mistake by the Lake”. But is it a mistake to truly believe in what the Cleveland Browns have done thus far in the NFL season? Well, I’m one of those people that tends to believe that good things happen in threes (or bunches anyways). And along with the return of Lebron James, the Browns have joined the sphere of relevancy. In the beginning it was all about Johnny Manziel and how long it would take before he took over for “veteran” signal-caller Brian Hoyer. But similar to last year’s sample-size output, Hoyer has thrived in the starting position. As game manager for a team without a true dynamic offensive weapon, Hoyer has managed to bring the Browns to a 6-3 record through Week 10. In a league enamored with West-Coast offenses and throwing the ball in excess, the Browns have stuck to the age-old theory of playing smash-mouth football on both sides of the ball. No individual running back has carried the load so far, but all three (Ben Tate, Terrance West, and Isaiah Crowell) have been productive in spurts and provided a spark when needed. Given a return by Josh Gordon (if he is ever off suspension) or the complete overall health of Jordan Cameron, the potential for more than a mere playoff appearance is possible. Unfortunately, there isn’t much in the receiving corps that leaves much hope. Andrew Hawkins makes great use of his limited ability, but he’s not dynamic enough for a slot receiver and even if he was there’s no one on the outside to distract the defense from him. Miles Austin isn’t a starting receiver in the NFL anymore based on talent, but he’s put up a decent attempt to get there anyways. Gary Barnidge shouldn’t be on an NFL roster, but he’s been productive when inserted into the lineup. The not-so-secret weapon to the Browns’ success may hinge on the play of Joe Haden. Much similar to the other AFC North teams, the Browns are built on defense. This D may eventually be known for having the best corner in the league (and certainly a top 5 guy- along with Patrick Peterson, Richard Sherman, Darrelle Revis and Prince Amukamara), along with a punishing run-defense. So far all the free agent signings of the past year seem to be making a bit more sense as well. When Karlos Dansby left the Cardinals, everyone thought it had to be about money. And that very well may have something to do with it, but Donte Whitner had options and still chose to come back to his place of birth. Paul Kruger is finally playing well after a horrible year a season ago. And Buster Skrine and Tashaun Gipson are benefitting off of the extra attention that Haden garners in the passing game. And Phil Taylor has been as steady as ever. Living in Ohio for my college years, I got to experience the despair of Cleveland fans in all aspects. But there’s one thing you can never say about them; these guys aren’t bandwagon fans. Now the recent overconfidence of many fans on various social media has been a bit annoying, but who can blame them? Even with a decent run in the 90s from the Indians and the early years of Lebron with the Cavs, there really hasn’t been much success. So now with two teams in the headlines (the Cavs for not so great reasons right now, but that will change), there is much reason to feel good about things. Looking ahead, I think it’s important to not pay too much attention to records because the Browns have struggled with bad teams and beaten up good teams. And there really is no such thing as a bad NFL team. Any team can win on a given day. But for the sake of prognosticating let’s take a gander anyways. Three of the next 7 games are at home and none of those games is against a weak team. Only of those teams (Houston) isn’t about .500 and that game is this week. While Atlanta and Carolina are not having good years, the Falcons play well at home and the Panthers may be playing for jobs (especially in Cam Newton’s contract year) at the end of the season. The other two games are at Buffalo and Baltimore, both teams that will certainly given the Browns a game. So let’s figure that Cleveland wins versus Houston, loses at Atlanta, wins at Buffalo, loses at Indianapolis, loses at home versus Cincinnati, wins at Carolina, and loses at Baltimore or something like that (maybe switching the results of Atlanta and Buffalo) that would leave them with a 9-7 record. Will Browns fans be happy in the end? From where they’ve traditionally been that shouldn’t be a question.